How do we find a good real estate attorney? Finding good attorneys or other service providers requires due diligence. Some providers are good at converting inquiries into customers, but not so good at delivering the service. 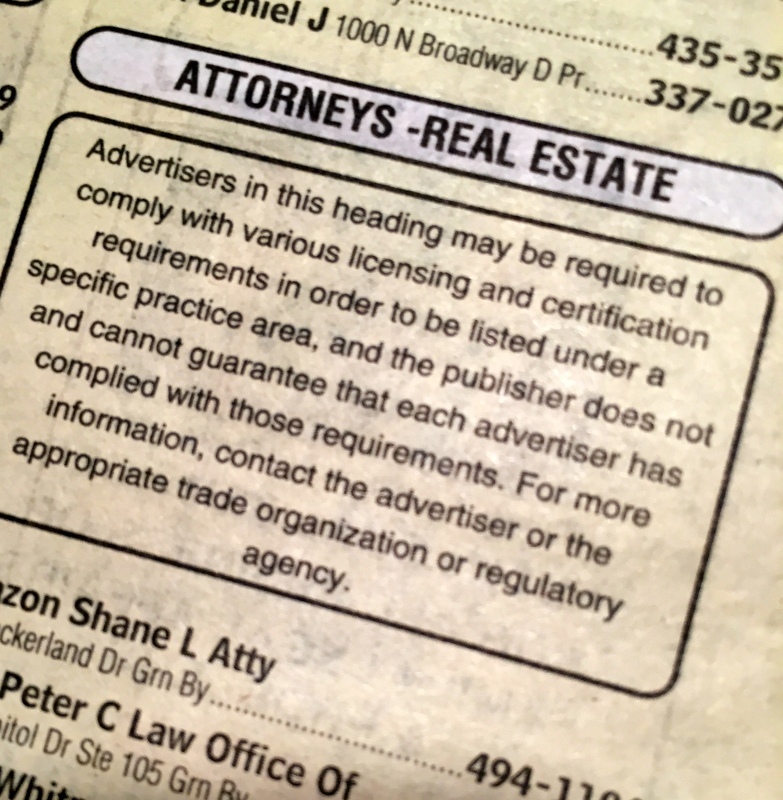 Reader Question: How do we find a good real estate attorney? Rob and Mary P.
Monty’s Answer: Here are 8 tips to find a good real estate attorney or other service provider through due diligence. Skill levels, personalities, specialty focus, workload, energy, expectations and more, impact personal service delivery models. Then, add in the human condition’s inability to recognize one’s limitations. We seldom hear “I am overcommitted right now, you would be better served with a different provider,” because turning revenue away can be difficult. Some providers are good at converting inquiries into customers, are but not good at delivering the service. Many referrals are given with “helping” in mind, but referrals can be tainted. While “word of mouth” is said to be the best advertising, it does not consider the motive behind the mouth from which the “word” is coming. Listen carefully for the reason the referrer is suggesting the name. If a referral is a neighbor, a relative or a nice person, it is no indication they are proficient at what they do. Ask a question; “Have you ever done business with them?” Or, “What is it about them that makes you want to refer them to me?” You would like to hear, ”We were in a real estate lawsuit a few years ago, and she presented our case so well the judge threw the plaintiff’s lawsuit out”. While that comment is no guarantee it will go smoothly for you, it is a better indicator than being a nice person. It is hard to know if a referral originates for remuneration, in ignorance or as the path of least resistance. Be cautious when a service provider has assembled a “team” of transaction related companies or individuals to help. While these teams may be legitimate, the likelihood of “lead bartering” or “insurance” referrals is higher. “Insurance” referrals are given to ensure the overall process is not slowed or derailed. Review your contact list for people whose work or interests would put them in contact with attorneys. A real estate person, title company employee, mortgage banker, businessperson, court reporter; to name a few. If necessary, walk into a title company or a real estate office and ask if anyone knows a good lawyer. When you have a list of three attorneys, call them on the phone or email them. Prepare in advance a one page “white paper” that briefly describes your situation. The first question is: “I need legal advice and looking for a lawyer who has successful real estate experience. Do you do that kind of work?” If the answer is “yes,” the second question is: “Great, I have a description of the situation and some questions to ask, can I email them to you?” Email is the best, because they have time to see your circumstances and consider the questions, and you will have their answers in writing. Is the situation we are facing the type of work you like? If I were to furnish you with all the documentation could you give me a sense as to the course of action to take, how long it would take to resolve and about what your services would cost? What would it cost for your time to determine the estimate? Do you handle the case yourself, or do you delegate certain tasks to others? What percentage of your practice is real estate work? If you were in my shoes, would you go ahead with this or would you take a different tact? Based on what you know today, do you think we would prevail? If the foregoing suggestions seem too laborious or time-consuming, an alternative that is faster, but loses the personal referral connection is to type “lawyer ratings” into a popular search engine. If you choose this option, skip to step two above. You want to know how they charge, their experience and how they evaluate your situation. This process creates work, but all of us know people in all jobs do not perform them in identical ways. Some people are clearly better at their jobs. Your goal is to find someone who is honest first and effective second. Following this process greatly increases your chances of hiring a winner. You will know whom to choose.